When you are preparing to tackle some household projects, you need the best equipment to handle the job. There will be a list of needs that you have. 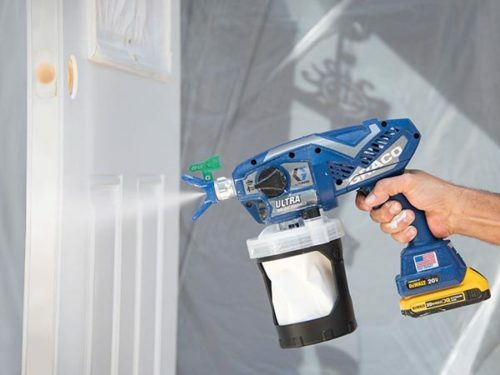 A latex paint sprayer is going to top the list of must-have tools to make the job easier. Trying to determine which type of spray gun is best for the job can be quite confusing, but it doesn’t have to be. Follow my complete guide to determine which sprayer to buy and learn more about available options. Detailed reviews can be found down the page. Latex paint is a water-based paint that has been mixed with acrylics or polymers. These are the binders in the paint. Many people use latex paints because of their resistance, adhesion, and washability. They are fast drying and can be applied in one coat. In addition, they are easy to clean up with soap and water. You may find that applying the latex paint with a paintbrush or roller works for you, but why not consider a spray gun? Spraying latex paint will help you to get the job done faster and accomplish more surface area at once than with a paint roller. It also works well for reaching those small crevices and corners. Your paint job will look even and clean. If you are just painting a small area, you can find latex paints in aerosol spray cans. To tackle a larger surface area, you will definitely want to opt for a spray gun instead. Let’s look at the different kinds of sprayers available and determine what will be the best for your needs. There are several types of sprayers on the market right now. Let’s take an in-depth look at each type and if it will work with latex painting jobs. A high volume low pressure or HVLP paint gun has become a popular way to spray paint. The low pressure that the gun uses to pull the paint out will reduce the over-spray that is found in traditional compressed paint guns. While it’s true that HVLP paint guns are best used with an oil-based paint, there are ways to make it work with latex as well. Latex paint can be quite thick and will need to be thinned when using an HVLP sprayer. If you don’t properly thin the paint it will come out of the gun in blobs or possibly not at all. Start by mixing the paint with 10 percent water. Continue increasing the water until you reach the desired consistency. Never use more than 25 percent water in any paint or it may not adhere to the surface. Airless sprayers help to get a job done much faster than other sprayers, rollers or brushing. They work best for latex paints too. This is because of the high power and ability to spray unthinned paints directly from the can or bucket. 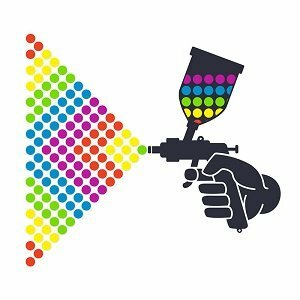 The spray gun operates by pumping paint at a high-pressure through a hose until it comes out the small hole of the gun tip. The tip then breaks the paint into a fan-shaped pattern. 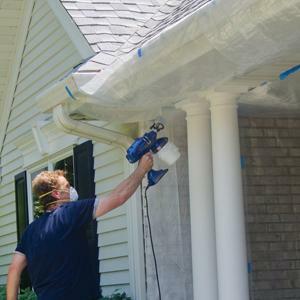 While spraying latex paint is a common thing to do with an airless spray gun, there are some things you’ll want to know. Not all of the particles of paint will stick to the surface. You could waste 20 to 40 percent of the paint depending on the job. That waste will end up floating in the air until it settles on an object nearby. To keep everything safe from the paint, you’ll have to do a lot of masking and covering up of objects. If you paint outside, you risk getting your shrubs or house painted. It also takes extra time to fully flush the paint from the pump and hose. Cleaning the spray gun and filters before storing can be time-consuming. A handheld sprayer is a great option for painting all different kinds of materials. Use it for furniture, bookshelves, cabinets, and more. The highly compressed air will allow you to take it outdoors as well and complete those fences or garage door painting jobs you’ve been neglecting. Thankfully, they don’t leave a mess behind and are much easier than rolling all the paint or using a paintbrush. Depending what model sprayer you choose, you might need to thin your latex paint slightly. Always go slowly to ensure that you haven’t made it too thin. After completing my research, I was able to spot 10 latex paint sprayers that will work for you! I have covered the top options in all types of sprayers below. I have also chosen some spray guns where a compressor is required to power them. Read on to get all the information. When looking for the best paint sprayer for latex, this is sure to show up on your radar. The full 4-finger trigger on this gun comes complete with a light. It also offers a smooth pull for optimum comfort and control. There is a safety lock for when you are not spraying. This gun has a maximum operating pressure of 3,600 PSI. The gun includes a built-in Hose Swivel, RAC IV 515 spray tip, 50 mesh gun filter and RAC IV hand-tight guard. You can use this with your Graco Magnum paint sprayer. The replaceable in-handle paint filter will reduce tip clogging and improves the finish. Use this for all home improvement projects that include primers, varnishes, stains or latex paint. Remember though, you will need a compressor or complete spray gun to power this product! This latex spray gun is perfect for larger projects. It allows for fully adjustable pressure so you are always in control of the paint flow. The stainless steel piston pump allows you to spray even unthinned paint at high pressures. The flexible suction tube allows you to spray either from a 1 or 5-gallon paint bucket. The PowerFlush adapter will connect directly to your garden hose for fast and easy cleanup. This unit can support up to 100-feet of paint hose so you can reach the second and third story of your home. Finally, use the RAC IV SwitchTip to reverse your tip when it gets clogged. Then, you’ll never have to stop spraying for a clog again. This Graco x7 is extremely powerful for a home DIY sprayer. It easily handles all types of latex and that’s why I have it as my number 1 choice. This fully adjustable sprayer allows you to control the pressure on any project. The stainless steel piston pump will enable you to spray paint even when it hasn’t been thinned at high pressures. The flexible suction tube allows you to spray directly from your 1 or 5-gallon paint bucket. For easy cleanup, attach the PowerFlush adapter to your garden hose and simply rinse it through. You can even use up to 75-feet of paint hose to supply an extra reach for your big projects. Don’t worry about clogs anymore with the RAV IV SwitchTip. It allows you to reverse the tip when it gets clogged so you can keep on spraying. The x5 also handles latex very well and is a little cheaper than the x7. This is because it is less powerful but it still works fantastically for home use. At only 3 pounds, this all-purpose and easy to clean paint spray gun is great for toting around to any job. The 2-piece construction with gun features an exclusive air valve design. This gun has a fully adjustable control to create a wide fan pattern. This spray gun comes complete with a 1-quart capacity dripless cup. You will also receive a nozzle size of 1.8mm. Keep in mind that this unit will require the use of a separate air compressor. Astro has produced a value for money spray gun that handles light latex immaculately. It also has the capacity to conquer heavier latex too. There is no thinning required when you use this sprayer. Use this for 4-8 quart projects like the garage doors, shutters, furniture and decks. The Tilt-N-Spray pendulum suction tube provides a full motion of spray. Use it up and down or sideways without losing prime. This sprayer includes a 515 TrueCoat reversible tip, 32oz cup with cover, 5 extra liners, pump armor storage, start-up tool, and instructional DVD plus storage case. This spray gun is perfect for any coating from stains to heavy latex and acrylics. You’ll love how easy this sprayer is to use and clean up. You’ll love how easy this sprayer is to use and clean up. The Truecoat II is the best handheld sprayer on the market. It easily gets through a variety of substances including latex. This is not always the case with other electric models. This compressor-mounted spray gun kit comes complete with a glass 16-ounce Mason jar. You can fill the jar with paints, stains, lacquers, and more. Simply attach it to the air compressor with a minimum ¾ horsepower. There are two simple adjustments to make with this unit; air supply regulation and height of liquid nozzle. These simple changes make it easy for a beginner to use. This is ideal to use when the bigger spray guns are too much for your small projects. The Critter may be small in size but is big on quality. Great option for small latex paint jobs. Looking for an HVLP spray gun for latex paint jobs? This compact and lightweight spray gun is perfect for getting into hard to reach areas. This set comes with two cup sizes; the professional grade metal cup for smaller fine finish applications and the 1 ½-quart plastic cup for larger jobs. The variable flow trigger dials down the spray pattern width from 1-inch to 10-inches. The powerful two-stage turbine is capable of spraying latex as well as thinner materials such as stains and lacquers. The 20-foot high-flex air hose will extend your reach and you can also choose from 3-spray patterns. If you like Wagner models then this is your best option. When you are on the hunt for the best HVLP paint sprayer for latex paint, Wagner has been a trusted household name for many years. The quick disconnect and Lock & Go technology of this unit provides the ability to change materials quickly. The 2-stage rated turbine provides a fine finish no matter what material you are spraying. This unit comes with replaceable filters to keep the particles separate from the paint. You’ll also enjoy two material cups; 1-quart for smaller interior work and 1 ½-quart for larger, exterior work. There are three patterns available; vertical fan, horizontal fan and round. You will also have complete control over the flow of spray. Works ok with latex but I prefer Graco models or its big brother the control max. Grab this Graco Magnum sprayer to enjoy fully adjustable pressure for the ultimate control no matter what you are painting. The stainless steel piston pump allows you to spray thick materials at high pressure. The flexible suction tube will give you the opportunity to spray directly from your 1 or 5-gallon paint bucket. The PowerFlush adapter connects right to your garden hose so cleanup is a cinch. The RAC IV SwitchTip allows reversal of the tip when it is clogged so you never have to stop painting. In addition, it will support up to 50-feet of paint hose so you can reach up to your second story with ease. The Project painter plus is similar to the x5 and x7 with lightweight and comes with a smaller hose. It is still a good purchase as it gets through latex easily. This gravity feed spray gun can be used for many different applications from woodworking to automotive and more. This one-piece, lightweight, aluminum gun body has a 13.5oz/0.4l aluminum cup to make your work easy. You can use the aluminum swivel cup to rotate the gun for those hard to reach areas. In addition, the stainless steel fluid needle and nozzle are corrosion resistant. Use the adjustable fluid fan pattern and air controls to make precise patterns and reduce waste. Another value for money spray gun that needs a compressor to power it. SPRAY-IT have a quality range of guns that never let me down. When picking your spray gun, there are several things you’ll want to keep in mind. Which sprayer will best fit your needs? Do you want an HVLP, airless or handheld sprayer? What features are important to you? You can look for adjustable models, quick cleanup, portability and what they are powered by. These are all important aspects to look for when picking your model. Look at the accessories that are included. Some models will offer extra items such as filters, hoses, and additional tips. Determine your price range. You can spend as little or as much as you want, so it would be important to determine what you want to spend ahead of time. Indoor or outdoor usage. Be careful when choosing your sprayer because some will only be designed for indoor or outdoor usage. Search for replacement parts. Before picking the model you want, verify that you will be able to order parts for it if something should go wrong. Read through the reviews. Other users are going to give you the best indication of how well a product works. Be sure you look for customers who have been using it for the projects you have planned. Now that we’ve discussed everything there is to know about the best latex paint sprayer, it is time to get working. You should be able to now pick what style of sprayer is best for your type of work. Whether you are painting furniture, doors or even cabinets, there is a sprayer out there that is right for you. Once you acquire the new gun, you’ll find projects popping up all over the house that needs to be done.